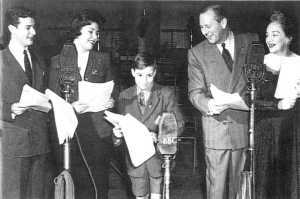 Life with The Lyons was a popular domestic sitcom featuring the real-life family group of Ben Lyon and Bebe Daniels with their children Barbara and Richard. Barbara's catch phrase was "I'll die. I'll just die". They first appeared on BBC radio in "Hi, Gang!". Their family pet dog was called "Skeeter". The programme later transferred to Television. The scripts were mostly written by Bob Block, Bebe Daniels and Ronnie Hanbury. Blob Block went on to write many other comedy shows, notably 'Rentaghost'.